Previously I’ve mentioned a little restaurant called La Maison in Newport, Oregon. Located in a small quaint house, this nine table French inspired restaurant puts out incredible food. They are open a few mornings, afternoons and during the summer a few evenings a week. Anyway last week for breakfast we dined on Eggs Sardou which is like a benedict but made with artichoke hearts and bacon on a homemade English muffin with Hollandaise sauce. The portions are large so we usually split a meal and then order separately a pastry or croissant. Today I noticed one person after another starting with a bowl of bananas and cream, not understanding exactly why the dish felt so familiar I ordered the same. 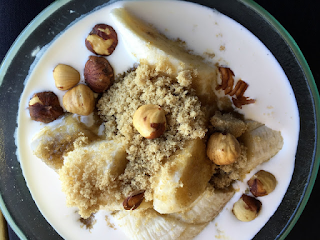 The bananas were served in a small bowl bathed in heavy cream and sprinkled with brown sugar and hazelnuts. As soon as I picked up my spoon I recalled my mom making something very similar. Several times a week when we were little she would slice bananas into a bowl, pour regular milk on top and then sprinkle with sugar. In fact bananas and milk was one of the first “meals” I prepared myself, how could I forget? Nostalgic and delicious; this combination is sweet, soft, crunchy and luxurious. Not exactly the bananas and milk that I grew up with but still a simple, elegant dessert that can be served before or after any meal, anytime of the day. Sweet sliced bananas bathed in heavy cream and sprinkled with brown sugar and roasted hazelnuts. Divide the sliced bananas between two serving bowls. Pour cream over the bananas in each dish. Sprinkle with brown sugar and hazelnuts. Enjoy! I like the sound of the eggs sardou. Never heard of those or this dish either. Such a lovely and wonderful dessert! Thanks Angie, simple is good. I love the fragrance of hazelnuts. Surely this is a perfect dessert to indulge! Thanks Karen, I love the smell of hazelnuts too. This sounds like the most delicious dessert, anything with bananas and brown sugar in is always welcome in my kitchen! Thanks Caroline, it sure is. Thanks Chris, I can't beleive I forgot all about this dish growing up. This sounds delish Cheri! And so simple to make and who doesn't love bananas with brown sugar, cream and hazelnuts - yum! thanks for a delicious breakfast idea! This dish looks sinfully delicious. I'm gad it brings back wonderful memories for you. Now, you're creating new ones for your family. Oh gosh, this is so interesting for me since I'd never heard of it until now. I love how the memory came back to you. It looks and sounds like such a great sweet treat. The restaurant sounds really charming, too. The restaurant is great, we only go a couple times a year and they have never let us down, the pastry and food is amazing. This looks absolutely wonderful Cheri, so rich and satisfying. I have to try it. Thanks Gerlinde, you are so sweet. Thanks Kim, the eggs sardou is my favorite thing to eat there but in all fairness it's the only thing we order besides a pastry or the banana dish. What a sweet memory Cheri. This post really made me smile. How do we forget these things? I love when a taste or smell jogs the memory and it comes to the front with gusto! What a great, simple dessert. Thanks for sharing! Thanks Tricia, I know it's crazy how certain foods bring back childhood memories. Cheri - this reminds me of a much simpler version of Bananas Foster! It's so simple, elegant and flavorful. I love it! And the Eggs Sardou sound amazing, too! Hi David, you know I've never had a bananas foster, will add to my list. the eggs sardou is my favorite. Oh my gosh! My grandmother used to make bananas like that, sliced, brown sugar and milk. I forgot all about it. Your version sounds delicious, Cheri! Eggs Sardou sounds delicious too! Thanks Pam, it's funny how certain foods invoke memories. Take care! Super combo of ingredients! And I happen to have some heavy cream on hand that needs using. And bananas. Hmmm . . . :-) Really good -- thanks. Thanks Susan, will definitely have to try bananas foster, but the flaming has always frightened me a little. This is what my perfect treat looks like. Great recipe! Love this desserts Cheri, look amazing!! love desserts with bananas! Thanks Gloria, we don't eat alot of bananas not sure why they are so delicious. What a simply elegant dessert. Perfect for nights when you want dessert but something easy and light. Thanks Laura, I've been on a small bananas and cream bender, so delicious! I've never heard of bananas and cream before. It does sound delicious, and perfectly simple for a summer treat!